Earlier this week, the Virginia Senate voted to ratify the Equal Rights Amendment. If the Virginia House of Delegates ratifies, Virginia will become the last state needed to secure the ERA’s place in our Constitution. However, it’s not an easy path, because two conservative men are determined to not let the ERA out of committee. You are needed, this Monday, in Richmond, to help get the ERA passed once and for all! 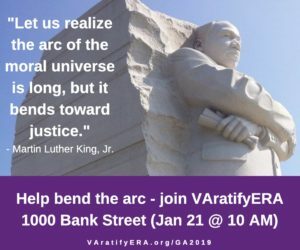 Virginia activists are especially seeking young people and children to go to Richmond on Monday and advocate for the ERA. 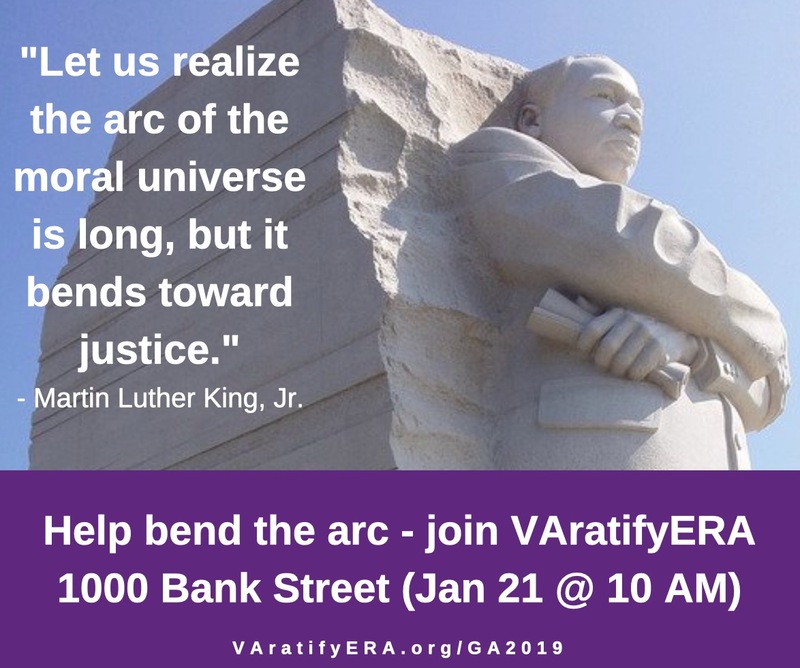 Please join the local Virginia ERA Coalition at 1000 Bank Street, Richmond, VA 23219 on January 21st at 10 a.m. Your presence is needed to show loudly and clearly that Virginia must pass the ERA! There will be a gathering at 10 a.m. as legislators arrive for work, followed by a press briefing and visits to legislators. For more information on parking and other resources, visit VAratifyERA.org/GA2019.